Madrid was amazing but getting to there was a struggle. Let me explain. My frugal self booked the earliest freaking flights available. But they’re so cheap! Yes, they were cheap at €40 each but I didn’t factor in the €35 taxi ride to the airport at 4:00am. Not only were we tired but our entire flight was full of American students from about 14-19 years old. I try my best to not be loud for a couple of reasons; 1. It is rude and 2. I do not want to further perpetuate the stereotype (read: truth) that Americans are loud. These students clearly don’t follow reason 1 or 2 that I listed so it was not the best flight in the world. And because we landed with half of America on the plane it took me nearly an hour to get through customs. To be fair to those working at Adolfo Suárez Madrid–Barajas Airport, all 10 lines for non-EU passports were open so they did the best they could! ANYWAY, once we made it to the area we were staying in we grabbed a quick bite to eat and opted for an early siesta. My advice? Pay the €10 or €20 extra for the later flight because it will be well worth it. In terms of public transport, we only used the Metro to get from the airport to our accommodation and then a high-speed train from Madrid to Barcelona, so I can’t really comment on how efficient it is or compare it to other cities in Europe. I love to walk cities as much as I can and found Madrid to be extremely walkable. I’ll touch on the high-speed train in my Barcelona post so keep an eye out for that! In general, I found Madrid to be extremely affordable, especially compared to Dublin. When we go on holiday we keep a daily budget and we pretty much always had money left over each day in Madrid. If you are coming from a city that has a reasonable cost of living (unlike Dublin), I could see where Spain might not be as cheap in your eyes, but more on the average side. However, we found meals and drinks to be of the same quality that we get in Dublin but at much more budget-friendly prices. 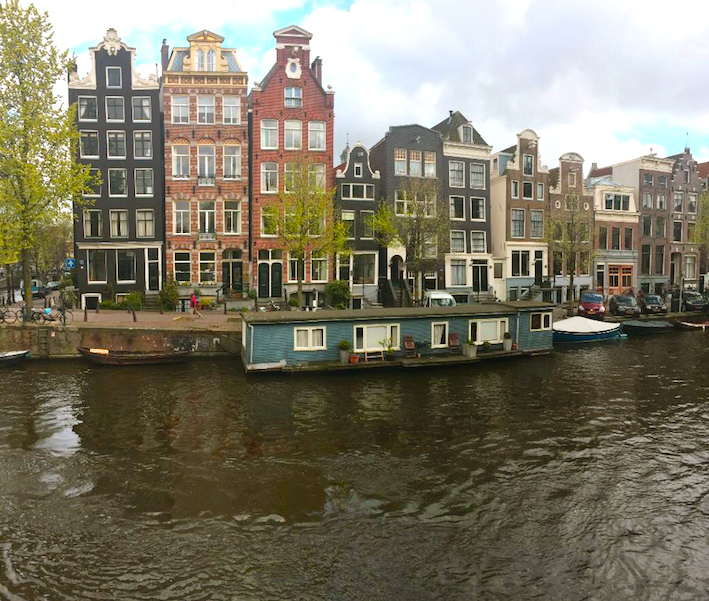 Okay, enough rambles and onto the goods – where you should stay, eat, drink, and what to check out! 3.5 days in April. The weather was around 15C/59F most days with the sun shining but it was still chilly in the shade and at night. We wore our summer clothes with a light jacket while most of the locals wore full on winter gear, lol. HOSTAL ADIS. We stayed in a private room with a private bathroom for 3 nights for €162. The room was nicer than your average hostel and was perfect for what we needed - a shower and somewhere to sleep! 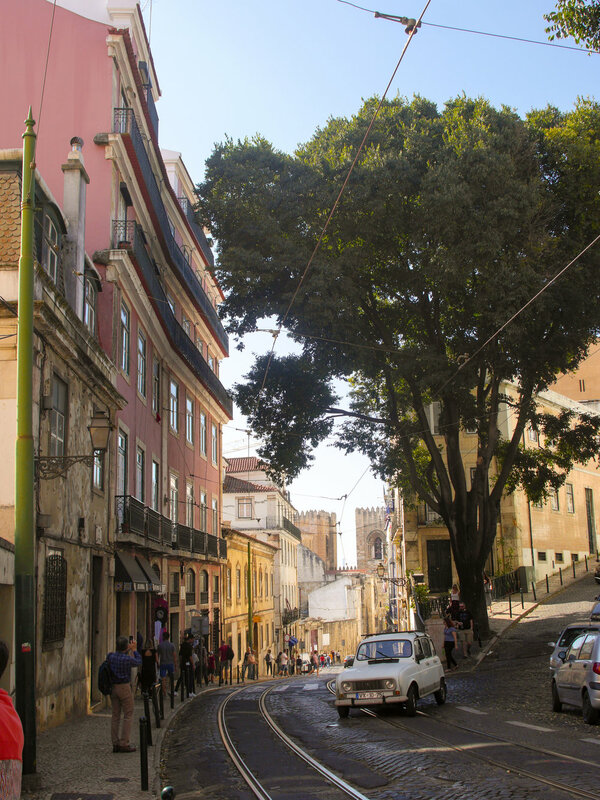 The accommodation was basic, but it was in walking distance to all shops, restaurants and bars, and sites we wanted to visit. FEDERAL CAFE – I don’t mean to be dramatic but the brunch we had here was not only the best brunch of the entire trip, but one of the best brunches I have ever eaten, full stop. I had the eggs (free-range, oven baked, with toast) with the mushroom option. This comes with gruyere, spinach and roasted hazelnut crème fraiche. I also got an iced coffee because this is now a luxury seeing as Ireland doesn’t particularly have the climate to properly enjoy them. The service here wasn’t amazing but I could deal with it for the food. I try to not repeat restaurants on holidays, but I nearly did for Federal Café. LA MAYOR CERVECERÍA - A great craft beer selection and yummy paella. You get a free drink with the paella too! I particularly enjoyed the La Cibeles Rubia which is brewed in Madrid. P had the ¡Ay, Carmela! and that was equally as delicious. We had 5 drinks between the 2 of us, the paella and a starter and got out for less than €40 with tip included. Can’t beat that. MERCADO DE SAN ILDEFONSO – I did more drinking than eating in here but because most vendors were for food, it is being included in this section. I discovered my new favorite brand of sangria here, Lolea. If anyone knows where I can get this in Ireland, please let me know! MERCADO DE SAN MIGUEL – This could honestly fall under each category because it has food, drink, and it was so fun to visit! I had a €3 summer wine to enjoy while (red wine with lemon soda, yummm!) walking around the market to all the different food stalls. There is something here for everyone – cheese, bread, baked goods, and of course, booze. CAFETERIA RESTAURANTE CASA DANI – If you are looking for an authentic Spanish tortilla/omelet you must check this place out. It is hidden in a market, and the market is down a side street (sounds sketchy but it isn’t, promise!) so it is a little hard to find, but so worth it. We each got a tortilla which comes with bread and ordered Americanos (con leche!) as well for only €8! ¡Vamos! BAR LA CAMPANA – If you are a calamari lover (like me!) you have to go here. Even if you don’t like calamari you should go because they offer other sandwiches as well. P got a chorizo sandwich and it was so delicious! The €3 calamari sandwich is the real star of the show here though and not to be missed. The bread was also insanely fresh. LA ROLLERIE – This was our last brunch in Madrid and it was the perfect send off. There are four in Madrid, so you shouldn’t be stuck getting into one. I loved that our meals came with fresh squeezed OJ. I didn’t realize how much I missed it until the first sip here. The service here was also some of the best we experienced while in Madrid. CHOCOLATERIA SAN GRINES – YUM. Don’t make the same mistake we did though and order a hot chocolate with 6 churros each. One order of these (only €3.50!) is plenty for 2 people to split. The churros are big and there is so.much.chocolate. The perfect dessert after a nice Spanish meal! BEE BEER – A bit hip for my liking, but the music was good and so was the beer. It was a little out of our way but still worth a visit if you like craft beer. 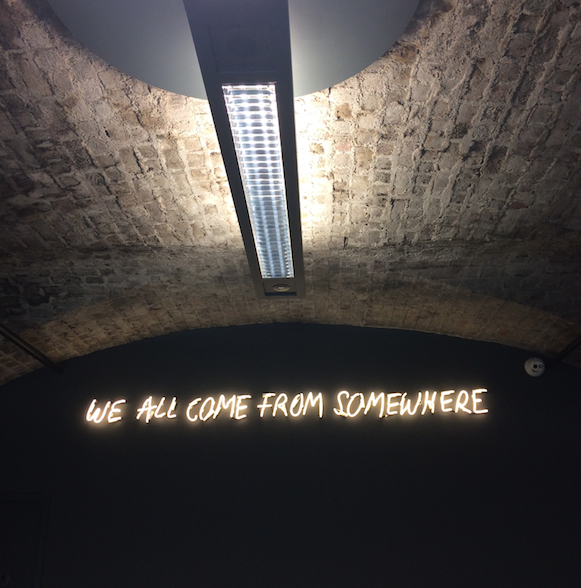 IRREALE – We were lucky to get a seat in here. The craft beer selection here is diverse and affordable. We also ordered the fingers de pollo al lúpulo and it was the perfect late-night snack to go with our beers. FABRICA MARAVILLAS – Surprise, surprise, another craft beer joint! FM is a small brewery who have their production facilities in plain sight in the pub. From what I could gather they seem to change beers out daily so you won’t find the same old, same old here. CAFE DE MAHON – We stumbled upon Café de Mahon but the atmosphere was relaxed and fun for a final drink before closing time. The bar staff wasn’t that nice (especially to a new girl who was only working her second shift!) but once I got my large €4 Estrella Damm Lemon I easily forgot about their bad attitudes! PARQUE DEL RETIRO – This park is so big and there is so much going on in it. I would recommend doing the boat ride if you visit. We rented a boat for 45 minutes for €6. It was something different to do if nothing else. 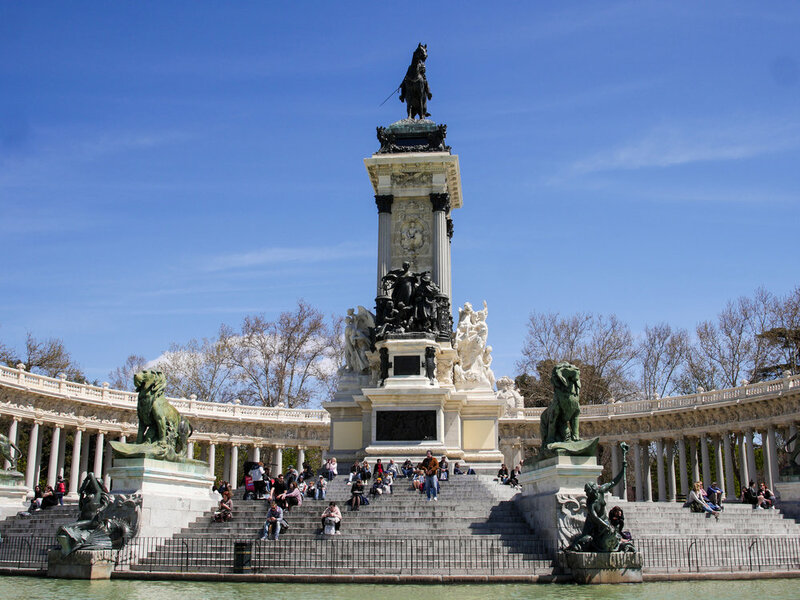 You will also get an amazing shot of the Monument to Alfonso XII if you row out! Unfortunately, the Palacio de Cristal del Retiro (located in the park) was not open on our visit as it was undergoing maintenance, but we did get to see a bit and I think it would be cool to be able to actually go in if you could. PLAZA MAYOR – Plaza Mayor was my favourite plaza of the trip and the one we spent the most time in. There are plenty of areas to sit in the sun and enjoy a drink or people watch. There are the typical street performers dressed up going around to get money so if that will annoy you, be warned. The calamari sandwich is also around here so grab a sandwich and enjoy it here! PUERTA DEL SOL – Close to Plaza Mayor, and one of the busiest places in Madrid is Puerta del Sol. There are buskers, street performers, and just a generally good vibe going on here. We came here a couple of times throughout the trip, but to tell y’all the truth, I was most excited when I found a Sephora here! We don’t have it in Ireland so this was a big deal. PLAZA DE ORIENTE – This is a gorgeous stop off before making your way to the Royal Palace of Madrid. The Royal Theatre and Royal Monastery of Incarnation are close too if you fancy dropping by either. I really liked the Monument to Philip IV! 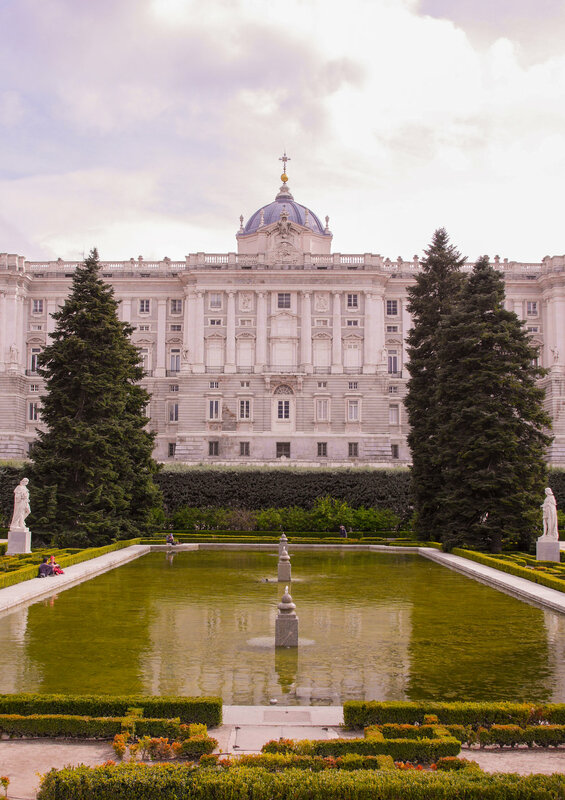 ROYAL PALACE OF MADRID – Just like you have to see Buckingham Palace in London, you need to see the Royal Palace of Madrid when in Madrid. The gardens around are stunning so make sure to take a walk through them too. If you’ve been to other gardens in Europe this is similar, but I still love going to them! PLAZA DEL DOS DE MAYO – If you haven’t noticed by now, there are a lot of plazas/squares to visit in Madrid. We didn’t spend as much time here but it was calm by day and at night was bustling with a young crowd enjoying the evening. Café de Mahon is around here and have an outdoor seating area so you can take it all with a nice cold beer! Madrid is the perfect city for an affordable and quick break. I would highly recommend visiting if you are thinking about planning a trip to Spain and need a nice, relaxing holiday from home! If you have been to Madrid and have any other recommendations please leave them in the comments! I love to hear from y’all! If you have any specific questions about Madrid, please don’t be shy about reaching out. You can leave me a comment below, send me a DM on Instagram, message me on Facebook or send me a tweet on Twitter. Don’t forget to follow me on Bloglovin' too!